The cold front that's whipped through the Bay Area has had a hand in developing the deadly Midwestern tornadoes. 7 California Tornadoes: Jeff Ranieri Has Rare Helicopter Views. Gay liberation, medical marijuana, anti-war feelings -- and Midwestern tornadoes? San Francisco and the surrounding environs are blamed for much of the country's societal ills -- perhaps unfairly -- but the region is scientifically accountable for the terrible weather that's plagued the Midwest, according to the San Francisco Chronicle. The cold, windy weather that's descended upon the Bay has had a hand in developing the tornadoes that have destroyed homes and killed over 100 people in Joplin, Missouri and other spots, according to the National Weather Service. "What starts here as the tail end of a cool trough can end there as a tornado," a meteorologist told the newspaper. "We get it first, and then it all moves east." Thursday looks breezy with a mix of sun & clouds. In other words, this cold front in the Bay Area has lead to the most severe tornado outbreak in the Midwest since 1974, according to the newspaper. At least 125 people were killed in Joplin, Mo. by a twister there Sunday. 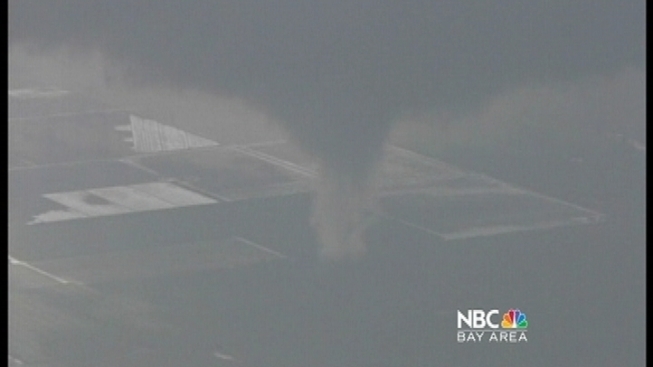 Tornadoes were also seen in Chico and other parts of Butte and Glenn counties in California. The cold trough coming off of the Pacific usually does one of two things -- after it passes through the Bay Area, it jets north or goes south. While people in Joplin, Missouri assess the tornado damage, at least on South Bay family, with ties to the region, is lending a hand from here. NBC Bay Area's Damian Trujillo reports. But if it keeps going east past Colorado, they run into moist and warm air coming up from Texas and the Gulf of Mexico. The mix of cold and warm and wet creates thunderstorms that roll north and turn into tornadoes.